Mozilla has released a new version of Firefox Monitor - a free security tool that helps you find out whether your email address was released in a data breach. 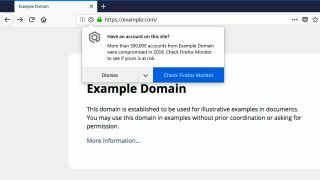 In addition to letting you check whether your account details have been leaked, Firefox Monitor 2.0 now includes desktop notifications that alert you if you visit a site that has reported a recent hack. The new feature works exclusively with Firefox Quantum, and will be rolled out over the next few days. If you land on a site that has been breached in the last 12 months, you will be presented with a pop-up warning giving you details of what happened, and the number of accounts compromised. The notification will only appear once per site, so if you've already checked your account and changed any passwords, you won't be bothered by repeated warnings. You can also disable the feature completely using the drop-down menu that appears on the notifications. To use check if your details have appeared in a data breach, visit the Firefox Monitor site and enter your email address. The tool will search a list of known data breaches, and notify you if it appears. You can also register to receive emails from Firefox Monitor if your address appears in any future breaches. The latest update also makes Firefox Monitor available in 26 languages, thanks to the efforts of Mozilla's community of volunteer translators.